There is nothing like the hurricane in the atmosphere. Even seen by sensors on satellites thousands of miles above Earth, the uniqueness of these powerful, tightly coiled storms is clear. Hurricanes are not the largest storm systems, nor the most violent—but they combine those qualities as no other phenomenon does, as if they were designed to be engines of death and destruction. In the Northern Hemisphere, these storms are called hurricanes, a term that echoes colonial Spanish and Caribbean Indian words for evil spirits and big winds. The storms are products of the tropical ocean and atmosphere: powered by heat from the sea, steered by the easterly trades and temperate westerlies, and driven by their own fierce energy. Around their tranquil core, winds blow with lethal velocity and the ocean develops an inundating surge. In addition, as they move ashore, tornadoes may descend from the advancing bands of thunderclouds. 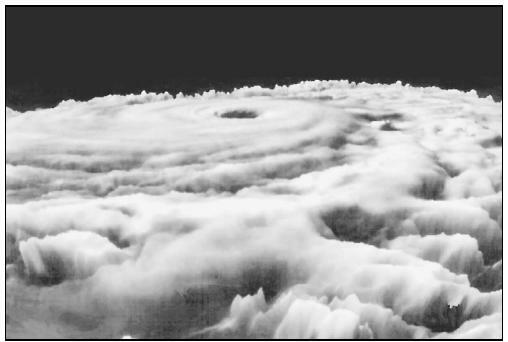 Computer-enhanced photo of Hurricane Diana, September 11, 1984.
tracks carry them. Mostly they are seen as engines of tragedy, which still leave death and destruction in their paths, even though the effectiveness of warning systems have doubled and redoubled in recent decades. It is the coming of summer to the Northern Hemisphere that ushers in conditions that spawn tropical storms and hurricanes. The movement of the sun—which is not really movement, of course, but a positional shift relative to Earth caused by the planet's year-long orbit—brings the peak power of solar radiation northward. The sun's track moves first to the equator, and from the sun's position over the equator in late March its apparent movement is northward to the Tropic of Cancer in late June, (23.5° north latitude), when it begins to retreat southward again in July, and August. Behind this solar track the sea and air grow warmer, and the polar airflows make a steady retreat. This northward shift of the sun brings the season of tropical cyclones to the Northern Hemisphere. This means it is time to look seaward, along our coasts. This is as true for Asia as it is for the United States and the Caribbean. Over the western Pacific, the tropical cyclone season is never quite over, but varies greatly in intensity. Every year, conditions east of the Philippines send a score of violent storms howling toward Asia, but it is worst from June through October. Southwest of Mexico, eastern Pacific hurricanes develop during the spring, summer, and fall. Most of these will die at sea as they move over colder ocean waters. But there are destructive exceptions when storms occasionally curve back toward Mexico and the southwestern United States, bringing flooding rains. Along the U.S. Atlantic and Gulf coasts, the nominal hurricane season lasts from June through November. Early in this season, the western Caribbean and Gulf of Mexico are the principal areas of origin. In July and August, this spawning center begins to shift eastward, and by early September a few storms are being born as far east as the Cape Verde Islands off Africa's west coast. Again after mid-September, most storms begin in the western Caribbean and Gulf of Mexico. In an average year, more than 100 disturbances with hurricane potential are observed in the Atlantic, Gulf, and Caribbean; on average, only 10 of these reach the tropical storm stage, and only about six mature into hurricanes. On average, two of these hurricanes strike the United States, where they are apt to kill 50–100 people, from Texas to Maine, and cause hundreds of millions of dollars in property damage. In a worse-than-average year, the same storms cause several hundred deaths, and property damage totaling billions of dollars. For the National Oceanic and Atmospheric Administration (NOAA), the hurricane season means another hazard from the atmosphere, at a time when tornadoes, floods, and severe storms are also playing seasonal havoc elsewhere on the continent. Given that the hurricane, as an engine, is inefficient and hard to start and sustain, and most tropical storms will never reach hurricane proportions, some tropical storms still do. A certain number every season will manage to accumulate the complex combination of natural forces required. When one does, it is an awesome natural event indeed. The young storm stands upon the sea as a whirlwind of awful violence. Its hurricane-force winds (winds greater than 63 knots) cover thousands of square miles, and tropical storm-force winds (winds of 34–63 knots) cover an area ten times larger. Along the twisting contours of its spiral are "rain bands" of dense clouds from which torrential rains fall. These spiral rain bands ascend in "decks" of cumulus and cumulonimbus clouds to the high upper-atmosphere. There, condensing water vapor is swept off as ice-crystal wisps of cirrus clouds by high-altitude winds. Lightning glows in almost perpetual pulsations in the rain bands, and this cloudy terrain is whipped by turbulence. At the lower levels, where the hurricane is most intense, winds on the rim of the storm follow a wide pattern, like the slower currents on the rim of a whirlpool; like those currents, these winds accelerate as they approach the central vortex. This inner band is the eyewall, where the storm's worst winds are found, and where moist air entering at the surface is "chimneyed" upward, releasing heat to drive the storm. In most hurricanes, these winds exceed 90 knots—in extreme cases they may double that velocity. Maximum winds run still higher in typhoons, the Pacific version of the same type of storm. Hurricane winds are produced, as all winds are, by difference in atmospheric pressure, or density. The pressure gradient—the rate of pressure change with distance—produced in hurricanes is the sharpest pressure gradient in the atmosphere, excepting only the pressure change believed to exist across the narrow funnel of a tornado. Atmospheric pressure is popularly expressed as the height of a column of mercury that can be supported by the weight of the overlying air at a given time. Weather maps show atmospheric pressure in millibars (mb), units equal to a thousandth of a bar. The bar is a unit of measure equal to 29.53 in of mercury in the English system, and to one million dynes per square centimeter in the metric system. In North America, barometric measurements at sea level seldom go below 29 in of mercury, and in the tropics the barometer reading is generally close to 30 in under normal conditions. Hurricanes drop the bottom out of those normal categories. The Labor Day hurricane that struck the Florida Keys in 1935 had a central pressure of only 26.35 in. Hurricane Gilbert, which wrought havoc in the Caribbean and the Yucatan Peninsula during 1988, was measured at 26.22 in in its eye. And the pressure change is swift: pressure may drop a full inch per mile. Such pressure contrasts guarantee tremendous wind velocity. 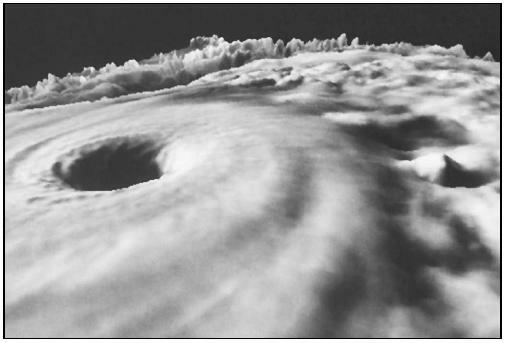 At the center of the storm is a unique atmospheric entity, and a persistent metaphor for order in the midst of chaos—the eye of the hurricane. It is encountered suddenly. From the heated tower of maximum winds and thunderclouds, one bursts into the eye, where winds diminish to something less than 15 knots. Penetrating the opposite wall, one is abruptly in the worst of winds again. A mature hurricane orchestrates more than a million cubic miles of atmosphere. Over the deep ocean, waves generated by hurricane winds can reach heights of 50 ft or more. Under the storm center, the ocean surface is drawn upward like water in a straw, forming a mound 1–3 ft or so higher than the surrounding ocean surface. This mound may translate into coastal surges of 20 ft or more. Besides this surge, massive swells pulse out through the upper levels of the sea. Hurricane Eloise, which struck the Florida panhandle in September 1975, taught scientists something new about the influence of passing hurricanes on the marine environment. Expendable bathythermographs dropped from NOAA research aircraft ahead of, into, and in the wake of the storm showed that the ocean was disturbed to depths of hundreds of feet by a passing hurricane. Moreover, the ocean "remembered" hurricane passage with internal waves that persisted for weeks after the storm had gone. The same storm also demonstrated that a passing hurricane can be felt deep in the sea-floor sediments. While a hurricane lives, the transaction of energy within its circulation is immense. The condensation heat energy released by a hurricane in one day can be the equivalent of energy released by fusion of 400 20-megaton hydrogen bombs. One day's released energy, converted to electricity, could supply the United States' electrical needs for about six months. From birth, the hurricane lives in an environment that constantly tries to kill it—and ultimately succeeds. The hurricane tends to survive while it is over warm water but forces drive the storm ashore or over colder water beyond the tropics. In these non-nourishing environments it will fall and die. This thrust away from the tropics is the clockwise curve that propels Atlantic hurricanes into the eastern United States, and takes eastern Pacific typhoons across the coastlines of Japan and into the Asian mainland. Even before a hurricane forms, the embryonic storm has forward motion, generally driven by the easterly flow of an air movement system of the tropic latitudes, featuring east to west flow of the atmosphere in which it is embedded. As long as this westerly drift is slow—less than about 20 knots—the young hurricane may intensify. More rapid forward motion generally inhibits intensification in the storm's early stages. Entering the temperate latitudes (north of the tropic of Cancer) some storms may move along at better than 50 knots, but such fast-moving storms soon weaken. At middle latitudes, the hurricane's end usually comes swiftly. Colder air penetrates the cyclonic vortex; the warm core cools, and acts as a thermal brake on further intensification. Water below 80°F does not contribute much energy to a hurricane. Even though some large hurricanes may travel for days over cold North Atlantic water, all storms are doomed once they leave the warm tropical waters that sustain them. The farther they venture into higher latitudes, the less fuel they receive from the sea; this lack of fuel finally kills the storms. Over land, hurricanes break up rapidly. Cut off from their oceanic source of energy, and with the added effects of frictional drag, their circulation rapidly weakens and becomes more disorganized. Torrential rains, however, may continue even after the winds are much diminished. In the southeastern United States, about one-fourth of the annual rainfall comes from dissipating hurricanes, and the Asian mainland and Japan suffer typhoons to get water from the sky. Hurricanes are often resurrected into extratropical cyclones at higher latitudes, or their dynamic forces combine with existing temperate-zone disturbances. Many storms moving up our Atlantic coast are in the throes of this transformation when they strike New England, and large continental lows are often invigorated by the remnants of storms born over the tropical sea. Hurricanes are the unstable, unreliable creatures of a moment in our planet's natural history. But their brief life ashore can leave scars that never quite heal. 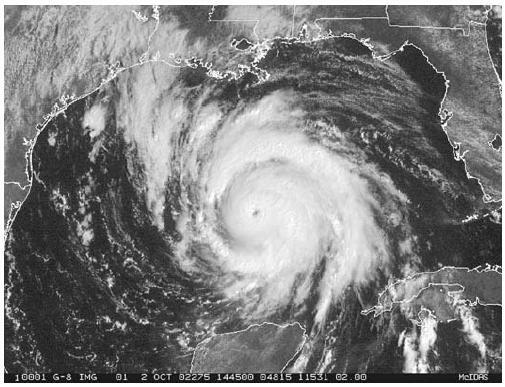 In the mid-1970s, the hand of 1969's Camille could still be seen along the Mississippi Gulf Coast and recovery from Florida's Hurricane Andrew in 1992 continued into the late 1990s. Most of a hurricane's destructive work is done by the general rise in the height of the seas that accompany the storm. This quick, tidal-like rise in sea level is called storm surge. Hurricane winds are a force to be reckoned with by coastal communities deciding how strong their structures should be. As winds increase, pressure against objects is added at a disproportionate rate. Pressure force against a wall mounts with the square of wind speed so that a threefold increase in wind speed results in a nine-fold increase in pressure. Thus, a 25 mph wind causes about 1.6 lb of pressure per square foot—a force of 50 lb. In 75 mph winds, that force becomes 450 lb and in 125 mph, it becomes 1,250 lb. For some structures this force is enough to cause failure. Tall structures like radio towers can be worried to destruction by gusty hurricaneforce winds. Winds also carry a barrage of debris that can be extremely dangerous. All the wind damage does not necessarily come from the hurricane. As the storm moves shoreward, interactions with other weather systems can produce tornadoes, which work around the fringes of the hurricane. Although hurricane-spawned tornadoes are not the most violent form of these whirlwinds, they add to the destruction. Floods from hurricane rainfall are quite destructive. A typical hurricane brings an awesome 6–12 in of short-duration rainfall to the area it crosses, and some have brought much more. The resulting floods—often sudden flash floods—have caused great damage and loss of life, especially in mountainous areas, where heavy rains can mean flash floods. Rains from the dying Hurricane Agnes brought disastrous floods to the entire Atlantic tier of states, causing 129 deaths and some $2.1 billion in property damage. The hurricane's worst comes from the sea, in the form of storm surge. This subtly approaching smash of tidal wave immensity actually claims nine of each 10 victims that fall to a hurricane. As the storm crosses the continental shelf and moves close to the coast, mean water level may increase 15 ft or more. The advancing storm surge combines with the normal astronomical tide to create the hurricane storm tide. In addition, wind waves 5–10 ft high are superimposed on the storm tide. This buildup of water level can cause severe flooding in coastal areas—particularly when the storm surge coincides with normal high tides. Because much of the United States' densely populated coastline along the Atlantic and Gulf coasts lies less than 10 ft above mean sea level, the danger from storm surge is multiplied. Nearly every coastal location that is exposed to a hurricane is also a candidate for the smashing blow of storm surge. Wave and current action associated with the surge also causes extensive damage. Water weighs some 1,700 lb per cubic yard; extended pounding by frequent waves can demolish any structures not specifically designed to withstand such forces. Currents set up along the coast by the gradient in storm surge heights and wind combine with waves to severely erode beaches and coastal highways. Many buildings withstand hurricane winds until their foundations, undermined by erosion, are weakened and fail. Storm tides, waves, and currents in confined harbors severely damage ships, marinas, and pleasure boats. In estuarine ine and bayou areas, intrusions of saltwater endanger the public health. In Asia, the price in life paid due to hurricanes has been enormous. As late as 1970, cyclone storm tides along the coast of what is now Bangladesh killed hundreds of thousands of persons. Eleven thousand people perished in a storm that struck that region in 1984, and even more in a storm seven years later. The Western Hemisphere has not had such spectacular losses, but the toll has still been high. In August 1893, a storm surge drowned 1,000–2,000 people in Charleston, South Carolina. In October of that same year, nearly 2,000 more perished on the Gulf Coast of Louisiana. More than 1,800 perished along the south shore of Florida's Lake Okeechobee in 1928 when hurricane-driven waters broached an earthen levee. Cuba lost more than 2,000 to a storm in 1932. Four hundred died in Florida in an intense hurricane in September 1935—the Labor Day hurricane that, until Hugo hit in 1989, shared with 1969's Camille the distinction of being the most severe to strike the United States mainland during the years of record keeping. Floods from 1974's Hurricane Fifi caused one of the Western Hemisphere's worst natural disasters, with an estimated 5,000 persons dead in Honduras, El Salvador, Guatemala, and Belize. Over one hundred years ago, in 1900, the great Galveston hurricane roared through the prosperous island city with winds in excess of 130 mph and a 15-ft storm surge. When it was finally over, at least 3,500 homes and buildings were destroyed and more than 8,000 people were killed. The number of people who lost their lives on that single day, September 8, 1900, represents more than the combined fatalities resulting from the 325 tropical storms and hurricanes that have struck the United States since then. In fact, that single event accounts for one third of all tropical storm or hurricane-related fatalities that have occurred in the United States since it was founded. All hurricanes are dangerous, but some are more so than others. The way storm surge, wind, and other factors combine determine the hurricane's destructive power. To make comparisons easier—and to make the predicted hazards of approaching hurricanes clearer to emergency forces—NOAA's hurricane forecasters use a disaster-potential scale, which assigns storms to five categories. Category 1 is a minimum hurricane; category 5 is the worst case. The criteria for each category are shown below. ONE Winds 74–95 mph. No real damage to building structures. Damage primarily to unanchored mobile homes, shrubbery and trees. Also, some coastal road flooding and minor pier damage. TWO Winds 96–110 mph. Some roofing material, door and window damage to buildings. Considerable damage to vegetation, mobile homes and piers. Coastal and low-lying escape routes flood two to four hours before arrival of center. Small craft in unprotected anchorages break moorings. THREE Winds 111–130 mph. Some structural damage to small residences and utility buildings with a minor amount of curtain wall failures. Mobile homes are destroyed. Flooding near the coast destroys smaller structures with larger structures damaged by floating debris. Terrain continuously lower than 5 ft above sea level (ASL) may be flooded inland as far as 6 mi. FOUR Winds 131–155 mph. More extensive curtain wall failures with some complete roof structure failure on small residences. Major erosion of beach areas. Major damage to lower floors of structures near the shore. Terrain continuously lower than 10 ft ASL may be flooded, requiring massive evacuation of residential areas inland as far as 6 mi. FIVE Winds greater than 155 mph. Complete roof failure on many residences and industrial buildings. Some complete building failures with small utility buildings blown over or away. Major damage to lower floors of all structures located less than 15 ft ASL and within 500 yd of the shoreline. Massive evacuation of residential areas on low ground within 10 mi of the shoreline may be required. At their strongest, the winds of Diana reached 130 mph. a northern track. Cline patrolled the beach and warned people to move to higher ground. With a population of more than 35,000 people, it is likely many more Galveston residents would have died without the warning. In 1900, the highest point in Galveston was only 8.7 ft above sea level and the hurricane easily inundated the city with a storm surge of 15 ft. With the terrible memories of the 1900 hurricane in mind, the people of Galveston began an unprecedented effort to protect their city from the next "big one." In 1902, they began constructing a 16-ft thick, 17-ft high sea wall covering 3 mi of oceanfront. They also began the monumental task of raising the entire island by as much as 8 ft with sand dredged from Galveston Bay. Today's sea wall has been extended to a length of 10 mi of oceanfront to protect the heart of the city. In the United States, the hurricane death toll has been greatly diminished by timely warnings of approaching storms. But damage to fixed property continues to mount. 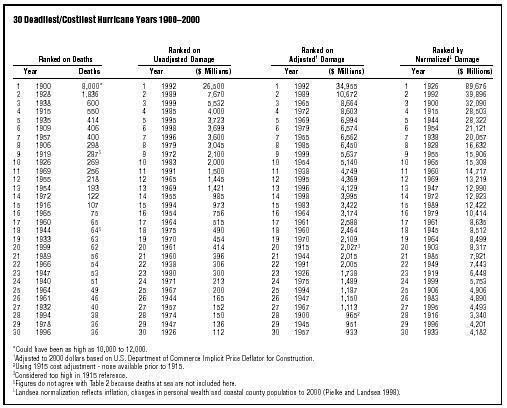 Camille, in 1969, caused some $1.42 billion in property damage. Floods from Agnes in 1972 cost an estimated $2.1 billion and damage from Frederic in 1979 hit $2.3 billion. Hugo, in 1989, wrought damage of more than $7 billion while coming ashore as a full-scale hurricane in South Car olina and moving hundreds of miles inland as a furious near-hurricane-strength storm. The National Hurricane Center (NHC, Tropical Prediction Center) near Miami, Florida, keeps a constant watch on oceanic storm-breeding areas for tropical disturbances which may herald the formation of a hurricane. If a disturbance intensifies into a tropical storm with rotary circulation and sustained wind speeds above 38 mph, the Center will give the storm a name. The tropical disturbance may never reach hurricane intensity, nevertheless it is given a name in anticipation that it may. Experience shows that the use of short, distinctive given names in written, as well as in spoken communications, is quicker, and less subject to error than the older, more cumbersome latitude-longitude identification methods. This is especially important in exchanging detailed storm information between hundreds of widely scattered stations, airports, coastal bases, and ships at sea. 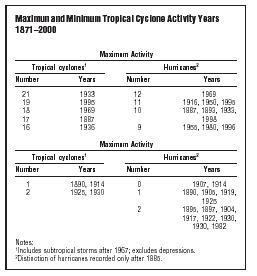 for six-year periods to designate hurricanes and tropical storms. The first tropical storm or hurricane of the year is given the first alphabetical name from the set for that year. After the sets have all been used, they are used again. The 2002 set, for example, is the same set used to name storms in 1996. The letters Q, U, X, Y, and Z are not included because of the scarcity of names beginning with those letters. Furthermore, in cases when a land-falling storm results in economic or human disaster, the storm name is retired. If over 24 tropical cyclones occur in a year, the Greek alphabet is used. The name lists have an international flavor because hurricanes affect other nations and are tracked by countries other than the United States. Names for these lists are selected from library sources and agreed upon by nations involved during international meetings of the World Meteorological Organization (WMO). The permanent populations of the hurricane-prone coastal counties of the United States continue to grow at a rapid rate. When weekend, seasonal, and holiday populations are considered, the number of people on barrier islands such as at Ocean City, Maryland; Gulf Shores, Alabama; and Padre Island, Texas, increases by 10-to 100-fold or more. Also, these areas are subject to inundation from the rapidly rising waters—the storm surge—associated with hurricanes that generally result in catastrophic damage and potentially large losses of life. Over the past several years, the warning system has provided adequate time for the great majority of the people on barrier islands and along the immediate coast to move inland when hurricanes have threatened. However, it is becoming more difficult each year to evacuate people from these areas due to roadway systems that have not kept pace with the rapid population growth. This condition results in the requirement for longer and longer lead times for safe evacuation. Unfortunately, these extended forecasts suffer from increasing uncertainty. Furthermore, rates of improvements in forecast skills have been far out-paced by rates of population growth in areas vulnerable to hurricanes. The combination of the growing populations on barrier islands and other vulnerable locations, and the uncertainties in the forecasts poses major dilemmas for forecasters and local and state emergency management officials alike, for example, how to prevent complacency caused by "false alarms" and yet provide adequate warning times. Preparations for hurricanes are expensive. When a hurricane is forecast to move inland on a path nearly normal to the coasts, the area placed under warning is about 300 mi in length. The average cost of preparation, whether the hurricane strikes or not, is more than $50 million for the Gulf Coast. This estimate covers the cost of boarding up homes, closing down businesses and manufacturing plants, evacuating oilrigs, etc. It does not include economic losses due to disruption of commerce activities such as sales, tourists canceling reservations, etc. In some locations, the loss for the Labor Day weekend alone can be a substantial portion of the yearly income of coastal businesses, for example, the losses experienced along the Florida panhandle during Hurricane Elena in 1985. 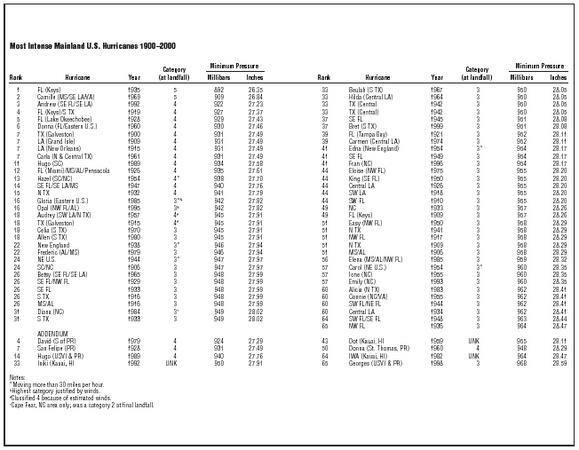 These lists are also re-cycled every six years (the 2002 list will be used again in 2008). If the width of the warned area has to be increased by 20% because of greater uncertainties in the forecast, the additional cost for each would be $10 million. If uncertainties in the hurricane strength require warning for the next higher category of hurricane, then major increases in the number of people evacuated and preparation costs would be required. Of course, if these uncertainties meant that major metropolitan areas such as Galveston/Houston, New Orleans, Tampa, Miami, or a number of other major coastal cities would or would not be included in the warning area, then the differences in preparation costs would be substantially more than the $10 million. Also, the number of people evacuated would be substantially more than tens of thousands of people. For instance, in the case of the Galveston/Houston area, an increase in storm strength from a category 2 hurricane to a category 3 hurricane on the Saffir-Simpson Scale would require the evacuation of an additional 200,000 people. Likewise, if major industrial areas such as Beaumont/Port Arthur, Texas, or tourist areas such as Atlantic City, New Jersey, were affected by these uncertainties, the financial impact would be quite significant. Economic factors receive serious consideration from the National Hurricane Center (NHC), and local and state officials consider not only direct, but also indirect effects, on people's response. People will not continually take expensive actions that, afterwards, prove to have been unnecessary. If we consistently overwarn by wide margins, people will not respond and such actions could result in large loss of life. To maintain credibility with the general public, NHC and local and state officials cannot treat all hurricanes as if they were Camilles, Hugos, or Andrews. Such an exaggerated approach may indeed provide maximum protection of life for a given event, but it endangers many more lives the next time when the threat may be even greater. Finally, the hurricane problem is compounded by the fact that 80–90% of the people who now live in the hurricaneprone areas have never experienced the core of a major hurricane (a category 3 or stronger on the Saffir-Simpson Scale). Many of these people have been through weaker hurricanes or been brushed by the fringe of a major hurricane. The result is a false impression of the damage potential of these storms. This frequently breeds complacency and delayed action that could result in the loss of many lives. For example, people living on barrier islands might be reluctant to evacuate under "blue sky" conditions until they actually see the threat (water rising and winds increasing). The result could be people trapped in those areas as water cuts off escape routes. This situation nearly happened for about 200 people on western Galveston Island during Hurricane Alicia of 1983. This type of response primarily results from three major factors. First, major hurricanes are infrequent events for any given location. Second, for the past three decades, major hurricanes striking the United States coast have been less frequent than previous decades, although that rate appears to be rising. Finally, it has been during this period of low hurricane activity that the great majority of the present coastal residents moved to the coast. However, with the tremendous increase of populations in high-risk areas along our coastlines, the concern is that we may now not fare as well in the future when hurricane activity inevitably returns to the frequencies experienced during the 1940s–60s. Hurricane Hugo, crossing the coast of South Carolina on September 21, 1989, at that point, was the strongest storm to strike the United States since Camille pounded the Louisiana and Mississippi coasts in 1969. At one point east of Guadeloupe, a NOAA research aircraft measured winds of 160 mph and a central pressure of 27.1 in, which rated Hugo as a category 5 storm—the highest on the Saffir-Simpson Scale. It was somewhat less fierce when it reached the United States mainland. When Hugo struck the Virgin Islands, Puerto Rico, and the Carolinas, it was classified as a category 4 hurricane. Storm tides of approximately 20 ft were experienced along part of the South Carolina coast, constituting record stormtide heights for the U.S. East Coast. Although the highest surges struck sparsely populated areas north of Charleston, South Carolina, damage was extensive and lives were lost. Forty-nine fatalities directly related to the storm were recorded; 26 in the United States and its Caribbean Islands, and 23 on other Leeward Islands. It is estimated that Hugo caused more than $9 billion in damage. The mainland of the United States alone accounted for $7 billion. Hurricane Andrew slammed into heavily populated south Florida as the most destructive storm in U.S. history. Andrew formed as a tropical wave off the African coast on August 14, 1992; by August 22, it was classified as a tropical storm. As it neared the Bahamas and Florida on August 23, Andrew had reached hurricane intensity. Andrew annihilated homes and businesses along a 30-mi path through the Dade County, Florida, towns of Homestead, Leisure City, Goulds, Princeton, Naranja, and Florida City. When it was over, more than 60,000 homes were destroyed and 200,000 people were left homeless. Andrew had a central pressure of 922 millibars (mb) at landfall making it among the three most intense hurricanes of the twentieth century. Only the infamous Labor Day hurricane that struck the Florida Keys in 1935 and Hurricane Camille in 1969 along the Mississippi/Louisiana coasts were as strong. Damage estimates have been as high as $25 billion. Fifteen people died in Florida as a direct result of Andrew's fury. Another 29 lives were lost as a result of indirect effects of the hurricane within the next three weeks. The relatively low loss of life, compared to the hundreds that died in the 1935 storm and in Camille, stands as a testimony to the success and importance of hurricane awareness campaigns, preparedness planning, and actions by the joint efforts of federal, state, county, and city emergency forces. The news media played a major role in the life-saving actions before, during, and after Andrew hit. As Andrew came ashore first in the northwest Bahamas, the storm surge reached an astonishing 23 ft. In Florida, a 17-ft storm tide, which headed inland from Biscayne Bay, is a record for the southeast Florida peninsula. Storm tides of more than 7 ft in Louisiana also caused severe flooding. Evacuation from threatened coastal areas is the only defense from the storm surge's potential for death and destruction. After the National Hurricane Center (NHC) issued hurricane watches and warnings, massive evacuations were ordered in Florida and Louisiana by emergency management officials. It is estimated that more than two million people evacuated to safety in Florida and Louisiana as Andrew approached. In the record books, it's still one of America's costliest hurricanes, and today National Oceanic and Atmospheric Administration (NOAA) scientists announced Hurricane Andrew was even stronger than originally believed when it made landfall in south Florida 10 years ago. Based on new research, scientists upgraded the storm from a Category 4, to a Category 5, the highest on the Saffir-Simpson Hurricane Scale. 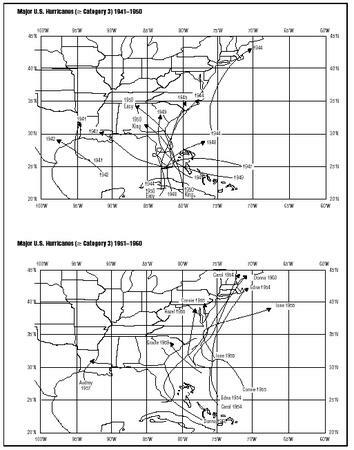 In their re-analysis of Hurricane Andrew's maximum sustained surface-wind speeds, NOAA's National Hurricane Center Best Track Committee, a team of hurricane experts, concluded winds were 165 mph—20 mph faster than earlier estimated—as the storm made landfall. Herbert Saffir, a structural engineer who co-designed the Saffir-Simpson Hurricane Scale, joined the committee as an observer and reviewed the team's results. The upgrade makes Andrew only the third Category 5 (wind speeds greater than 155 mph) hurricane on record to strike the continental United States. The other two Category 5 storms were the "Florida Keys 1935 Hurricane," and Hurricane Camille in 1969. There is always some uncertainty in determining the maximum winds in a hurricane, and Andrew is no exception. The NHC's previous estimate was 145 mph, based on the science available in 1992. With advanced research techniques and technology, NHC now estimates the winds were stronger. Hurricane Hugo prepares to strike Charleston, South Carolina, in 1989. Hurricane Andrew's path of destruction, August 1992. Andrew was directly responsible for 23 fatalities in Florida and Louisiana, and about $25 billion in damages (1992 dollars), according to NOAA. 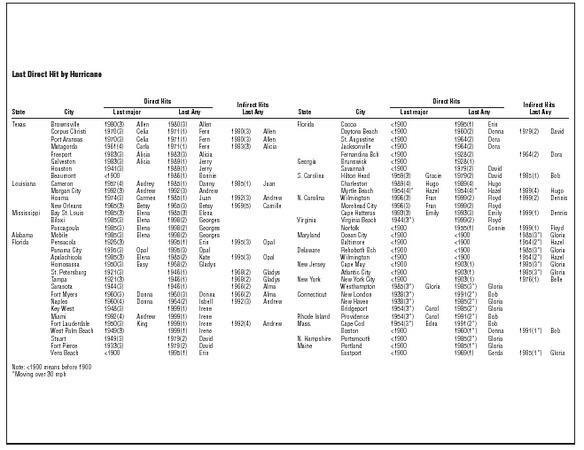 The National Hurricane Center has had an ongoing program to review the historical record of all storms. Scientists and other researchers note that society needs an accurate account of the frequency and intensity of past catastrophic events to best plan for the future. 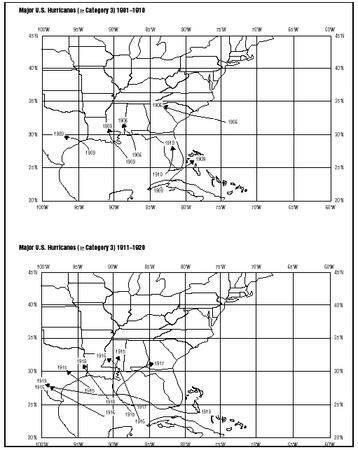 The Best Track Committee at the NHC recently completed a review of a re-analysis of storms from 1851 to 1910. Since 1997, forecasters have used Global Positioning System dropwindsondes, a measuring device dropped from hurricane reconnaissance aircraft into the eyewall—the windiest part of the hurricane. The sonde system measures temperature, barometric pressure, water vapor, and wind data every 15 feet on its way down. This new method gave meteorologists an important glimpse into the true strength of these devastating storms. The analyses of the dropwindsonde data indicated that, on average, the maximum sustained surface-wind speed was about 90 percent of the wind speed measured at the 10,000-foot aircraft level flown as Andrew approached south Florida. In 1992 Andrew's wind speed was estimated at 75 to 80 percent of the aircraft observations. The research findings resulted in an increase in the estimated wind speeds of Hurricane Andrew from 145 mph to 165 mph. Hurricane Andrew was a Category 5 over open water on approach to South Florida. Hurricane Andrew was a Category 5 on the Saffir-Simpson Hurricane Scale at time of landfall, with Category 5 winds occurring in a small area on the immediate coast having open exposure to Biscayne Bay. Winds at specific locations over land in Miami-Dade County are unknown due to remaining scientific uncertainties. There should be continuing research aimed at better determining hurricane winds immediately preceding, and during landfall. The "Hurricane Landfall" component of the U.S. Weather Research Program is structured to address such a question. When Hurricane Andrew hit southeast Miami-Dade County, Florida, August 24, 1992, flying debris in the storm's winds knocked out most ground-based wind measuring instruments, and widespread power outages caused electric-based measuring equipment to fail. The winds were so strong many wind-measuring tools were incapable of registering the maximum winds. Surviving wind observations and measurements from aircraft reconnaissance, surface pressure, satellite analysis, radar, distribution of debris, and structural failures were used to estimate the surface winds. Fran was a Cape Verde hurricane that started as a tropical wave off the African west coast on August 22, 1996. The wave escalated to a tropical storm on August 27 (about 900 mi east of the Lesser Antilles), and finally made landfall on the North Carolina coast as a category 3 hurricane on September 6. At its peak, Fran's minimum central pressure dropped to 946 mb and sustained surface winds reached 105 knots (on September 5); at landfall the minimum central pressure hit 954 mb and winds were approximately 100 knots. Fran eventually weakened to below-hurricane levels as it moved through Virginia and up through the eastern Great Lakes where it became extratropical. Hitting at the peak of hurricane season, Fran's strength resulted in major storm surge flooding in the North Carolina coastal area, wind damage in North Carolina and Virginia, and significant flooding up through Pennsylvania. Storm-surge flood levels in North Carolina (primarily southwest of Cape Lookout) are estimated to have reached 8–12 ft; some outside water and debris marks are higher, due to breaking waves. And while Fran typically caused more than 6 in of rainfall in its path, up to 12 in were reported in two counties of North Carolina. Inland flooding was also extensive. In Alexandria, Virginia, for example, the Old Town historic district had to be partially evacuated as 3 ft of water covered the streets due to the rising Potomac River. The casualty and damage figures for Fran are significantly higher than for those of Bertha (July 1996). Thirty-four people died in storm-related incidents, and 21 of those reported were in North Carolina. In an effort to avoid the hazards of downed power lines, flash floods, and damaging winds, nearly a half-million people were evacuated from the North and South Carolina coasts. Fran's wrath wrought nearly $3.2 billion in total U.S. damage, with the bulk of that damage (about $1.275 billion) in North Carolina. The 1998 season will be remembered as being one of the deadliest in history—and for having the strongest October hurricane on record. It was a very active season with 14 named tropical storms of which 10 became hurricanes. Three of these were major hurricanes—category three, four, and five on the Saffir-Simpson Hurricane Scale. 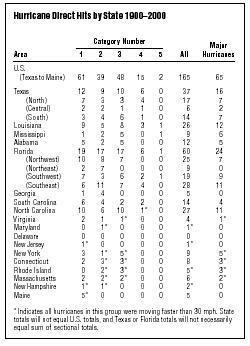 The four-year period of 1995–1998 had a total of 33 hurricanes—an all-time record. Tropical cyclones claimed an estimated 11,629 lives in 1998. Of that total, 11,000 were due to hurricane Mitch in Central America. Not since 1780 has an Atlantic hurricane caused so many deaths. Seven of the tropical storms and hurricanes hit the United Sates, which is more than twice the average. Total damages in the United States stands at $6.5 billion. The season started a little late, but more than made up for lost time. There were no tropical cyclones in June and the first storm of the season, tropical storm Alex, developed on July 27. Then, in a hyperactive 35-day span from August 19 to September 23, 10 named tropical cyclones formed in October—including Lisa and powerful hurricane Mitch. The season concluded with hurricane Nicole in late November. On September 25, there were four Atlantic hurricanes in progress at once. This is the first time such an event was observed since 1893. Bonnie developed from a tropical wave over the Atlantic about 900 mi east of the Leeward Islands on August 19, and became a tropical storm a day later. It moved on a west-northwestward track, skirting the Leeward Islands. Late on August 21, the storm strengthened into a hurricane located about 200 mi north-northeast of eastern Hispaniola. Bonnie strengthened to its maximum wind speed of 115 mph late on August 23 while located about 175 mi east of San Salvador in the Bahamas. The hurricane turned toward the northwest and stayed east of the Bahamas. Bonnie then headed toward the southeast U.S. coast in the general direction of the Carolinas, gradually turning toward the north-northwest and then north. As the center neared the coast, its forward speed slowed. The eye of Bonnie passed just east of Cape Fear, North Carolina, late on August 26. Bonnie made landfall near Wilmington as a category two hurricane early on August 27. It weakened to a tropical storm while moving slowly over eastern North Carolina. As the storm moved off the coast in the vicinity of the outer banks near Kitty Hawk, it re-strengthened into a hurricane. Bonnie soon weakened back to a tropical storm as it moved northeastward to eastward over the Atlantic into cooler waters, becoming extratropical about 240 mi southeast of Cape Race, Newfoundland. Three deaths were caused by Bonnie and the damage total is estimated to be $720 million. The tropical depression that was to become Danielle formed early on August 24 about 700 mi west of the Cape Verde Islands. Tropical storm status was reached later that day. Moving west-northwestward, Danielle rapidly strengthened into a hurricane and reached the first of several peak intensities near 105 mph while centered about 1,040 mi east of the Leeward Islands. For the next several days, the hurricane continued west-northwestward, gradually slowing in forward speed. Danielle turned northwestward and northward on August 30–31, passing about 230 mi northwest of Bermuda early on September 2, and winds at Bermuda briefly reached tropical storm force. Danielle lost tropical characteristics about 260 mi east-southeast of Cape Race late on September 3. Earl developed over the southwest Gulf of Mexico on August 31. The tropical depression became a tropical storm later that day but had a poorly defined center that was difficult to track. The general motion was north and then north-eastward, becoming a hurricane located about 150 mi south-southeast of New Orleans, Louisiana. After briefly reaching 100 mph winds, Earl made landfall over the Florida panhandle near Panama City as a category one hurricane early on September 3. It weakened to below hurricane strength soon after making landfall and became extratropical on September 3 while moving northeastward through Georgia. Earl was directly responsible for three deaths and the total damage estimate is $79 million. Georges formed in the far eastern Atlantic from a tropical wave early on September 15, and became a tropical storm on the morning of September 16. 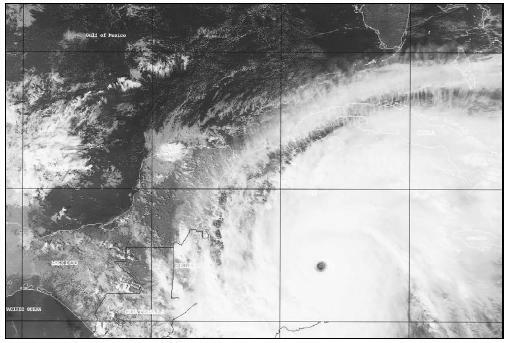 By late afternoon on September 17, satellite imagery indicated that Georges developed an eye and had become a hurricane. Georges moved on a general west to west-northwest course at 15–20 mph for the next several days. During this period, Georges is estimated to have reached a peak intensity of 155 mph category 4, and a minimum central pressure of 937 mb early on September 20 while located about 420 mi east of Guadeloupe in the lesser Antilles. Georges's first of many landfalls occurred at Antigua in the Leeward Islands late on September 20. After moving near or over other islands of the northeast Caribbean, including the U.S. Virgin Islands, it then hit Puerto Rico on the evening of September 21 with estimated maximum winds of 115 mph. Georges weakened very little while over Puerto Rico and was even stronger when it made landfall in the Dominican Republic on the afternoon of September 22, with estimated maximum winds of 120 mph. Georges weakened after crossing the mountainous terrain of Hispaniola and made landfall in eastern Cuba on the afternoon of September 23 with estimated maximum winds of 75 mph. The hurricane continued along the northern coast of Cuba for most of September 24. Thereafter, Georges moved into the Florida Straits early on September 25 and re-intensified making landfall near Key West, Florida, on mid-morning of September 25 with estimated maximum winds of 105 mph. Georges continued on a general west-northwest to northwest track on September 26–27, turning to a north-northwest heading and gradually slowing down as it approached the coast of the central Gulf of Mexico. Georges made its final landfall near Biloxi, Mississippi, early on September 28 with 105 mph winds. Georges meandered over land and weakened to a tropical storm later that day. Georges was downgraded to a tropical depression by mid-morning on September 29 while located about 35 mi north-northeast of Mobile, Alabama. The remnant weak circulation center moved off the Georgia/South Carolina coast on October 1, becoming involved with a frontal zone and dissipating. Georges caused one death and the total U.S. damage estimate is $5.1 billion. Jeanne became a tropical storm unusually far to the east, close to the west coast of Africa early on September 21 and intensified into a hurricane the following day. It brushed the Cape Verde Islands while moving west-northwestward for a couple of days, reaching a peak intensity of 105 mph on September 24 about 650 mi west of those islands. The hurricane turned toward the north over the east-central Atlantic late on September 26, then toward the northeast and east-northeast. Jeanne weakened to a tropical storm on September 29, then dropped below storm strength in the vicinity of the Azores and lost its tropical characteristics late on September 30. In an awesome display of power and destruction, hurricane Mitch will be remembered as the most deadly hurricane to strike the Western Hemisphere in the last two centuries! Not since the Great Hurricane of 1780, which killed approximately 22,000 people in the eastern Caribbean, was there a more deadly hurricane. Mitch struck Central America with such viciousness that it was nearly a week before the magnitude of the disaster began to reach the outside world. The death toll has been reported as 11,000 with thousands of others missing. Though the final death toll will never be known, it is quite likely that Mitch directly killed more people than any Atlantic hurricane in over 200 years. More than three million people were either homeless or severely affected. In this extremely poor third world region of the globe, estimates of the total damage from the storm are at $5 billion and rising. The President of Honduras, Carlos Flores Facusse, claimed the storm destroyed 50 years of progress. Hurricane Mitch (October 1998), a category 5 storm, was the deadliest hurricane since 1780.
that Mitch was one of the strongest storms ever recorded in the Atlantic. After threatening Jamaica and the Cayman Islands, Mitch moved westward and by 2100 UTC on October 27, the category 5 storm was about 60 mi north of Trujillo on the north coast of Honduras. Preliminary wave height estimates north of Honduras during this time at the height of the hurricane are as high as 44 ft, according to one wave model. Although its ferocious winds began to abate slowly, it took Mitch two days to drift southward to make a landfall. Coastal regions and the offshore Honduras island of Guanaja were devastated. Mitch then began a slow westward drift through the mountainous interior of Honduras, finally reaching the border with Guatemala two days later on October 31. Although the ferocity of the winds decreased during the westward drift, the storm produced enormous amounts of precipitation caused in part by the mountains of Central America. As Mitch's feeder bands swirled into its center from both the Caribbean and the Pacific Ocean to its south, the stage was set for a disaster of epic proportions. Taking into account the orographic effects by the volcanic peaks of Central America and Mitch's slow movement, rain fell at the rate of 1–2 ft per day in many of the mountainous regions. Total rainfall has been reported as high as 75 in for the entire storm. The resulting floods and mudslides virtually destroyed the entire infrastructure of Honduras and devastated parts of Nicaragua, Guatemala, Belize, and El Salvador. Whole villages and their inhabitants were swept away in the torrents of floodwaters and deep mud that came rushing down the mountainsides. Hundreds of thousands of homes were destroyed. struck the region. At least seven were injured when a tornado swept from Marathon to Key Largo. A second tornado touched down at Miramar, north of Miami. At Fowey Rocks Lighthouse, just southeast of Miami, a wind gust of 73 mph was reported. Across south Florida, some 100,000 customers lost electrical power. One person was killed in the United States near Dry Tortugas when a fisherman died from a capsized boat. A second person was missing. Another person died as a result of an auto accident on a slick highway. Mitch passed through the Bahamas and finally became extratropical on November 5. The 1999 Atlantic hurricane season produced the most deadly hurricane to hit the United States in 28 years, Floyd, which killed 56 people. Three hurricanes hit the U.S. mainland, Bret, Floyd, and Irene, as category 3, 2, and 1 hurricanes, respectively. Hurricane Dennis produced near-hurricane conditions as it moved along the North Carolina coast but made landfall as a tropical storm. Tropical Storm Harvey also made landfall in the United States. The U.S. Virgin Islands experienced Hurricane Lenny. In all, there were four tropical storms, and eight hurricanes during 1999, and five reached intense hurricane status. 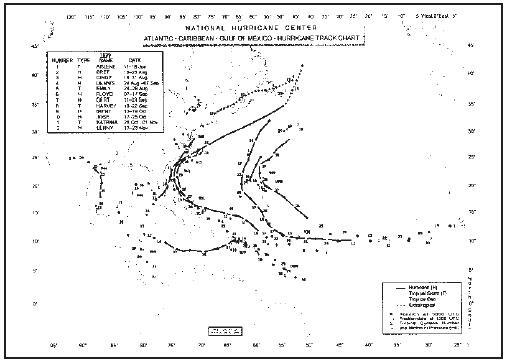 Four tropical storms were consistent with long term average (1950–98), the eight hurricanes were above the long-term average of six per season. 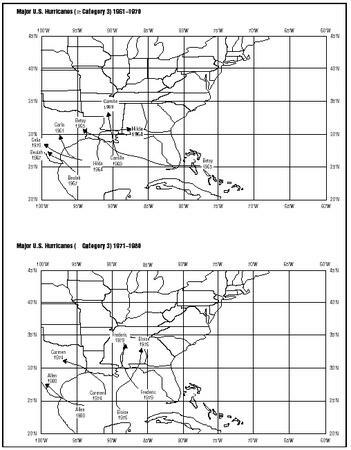 Only one system during the 1999 season developed prior to August 18, and four systems developed after October 12. Three of these late-season storms became hurricanes, with the last (Hurricane Lenny) reaching category 4 status. Lenny developed in mid-November and moved eastward across the central Caribbean Sea. This unusual track enabled it to become the first hurricane to strike the Lesser Antilles Islands from the west. portion of Kenedy County. This region had been spared a land-falling hurricane in recent years, as the last hurricane to hit the Texas coast was Jerry in October, 1989. Hurricane Dennis threatened the North Carolina coast, the fourth tropical storm scare in as many years, during August 29–30. The center of Dennis was within 60 mi of the North Carolina coast early on August 30 as a strong category 2 hurricane with highest sustained winds of 105 mph. Due to the fact that the hurricane never made landfall, damage was only moderate. Rainfall amounts approached 10 in in coastal southeastern North Carolina, and beach erosion was substantial. Four people were killed in Florida due to high surf, and a tornado in Hampton, Virginia, produced several serious injuries. Hurricane Floyd brought flooding rains, high winds, and rough seas along a good portion of the Atlantic seaboard on September 14–18. The greatest damages were along the eastern Carolinas northeast into New Jersey, and adjacent areas northeastward along the East Coast into Maine. Several states had numerous counties declared disaster areas. Flooding caused major problems across the region, and at least 77 deaths were reported—57 directly related to the hurricane. Damage estimates range from three to over six billion dollars. Although Hurricane Floyd reached category 4 intensity in the Bahamas, it weakened to category 2 intensity at landfall in North Carolina. 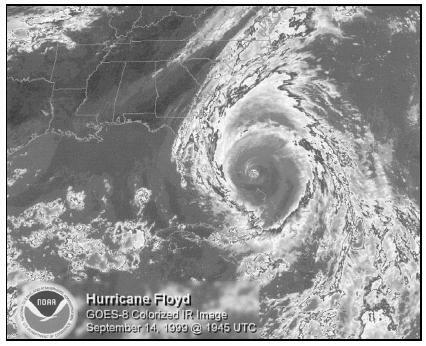 Floyd's large size was a greater problem than its winds, as the heavy rainfall covered a larger area and lasted longer than with a typical category 2 hurricane. Approximately 2.6 million people evacuated their homes in Florida, Georgia, and the Carolinas—the largest peacetime evacuation in U.S. history. Ten states were declared major disaster areas as a result of Floyd, including Connecticut, Delaware, Florida, Maryland, New Jersey, New York, North Carolina, Pennsylvania, South Carolina, and Virginia. There were several reports from the Bahamas area northward of wave heights exceeding 50 feet. The maximum storm surge was estimated to be 10.3 ft on Mason-borough Island in New Hanover County, North Carolina. Hurricane Irene brought heavy rains to the Florida Keys northward to central Virginia during the middle of October. Some places in eastern North Carolina and eastern Virginia received over 12 in of additional rains, adding to the flooding problems. Eight people were killed from electrocution and drowning. Hurricane Lenny, a very unusual west-to-east moving low latitude hurricane, battered portions of the Caribbean around mid-November. Lenny was a strong category 4 hurricane on November 17 with winds of 150 mph sustained and an estimated central pressure of 929 mb. Lenny was the second strongest storm of the twentieth century to hit the Virgin Islands, second only to Hurricane David in 1979. 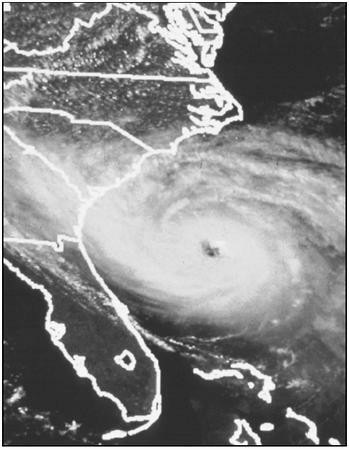 Lenny as of November 17 was slightly stronger than Hugo at landfall in South Carolina in 1989. Hurricane Lenny was responsible for 15 deaths directly associated with the storm, including three deaths in Dutch St. Maarten, two in Colombia, five in Guadeloupe, one in Martinique, and four offshore. 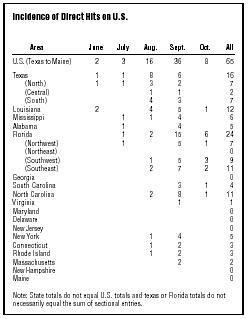 The above-average 2000 Atlantic hurricane season continued the recent upturn in activity, but the United States was spared extensive hurricane damage. This was the third consecutive year of above-average activity. NOAA says that the increased activity was likely an indication that global climate variations on decadal time scales are again favoring more active Atlantic hurricane seasons. NOAA researchers are studying the decadal cycles and how storm paths this year may have been affected by a Bermuda high pressure system made weak without the influence of El Niño or La Niña. There were 14 named storms in 2000, including eight hurricanes and three intense hurricanes. The current long-term averages are 9.3 named storms, 5.8 hurricanes and 2.2 intense storms. Only two named storms hit the mainland, both in Florida. Hurricane Gordon weakened into a tropical storm when it hit land September 17, and Helene came ashore as a weak tropical storm September 23. This is the first time since 1994 that the U.S. mainland was spared a landfall storm of hurricane strength. Tropical Storm Beryl made landfall 150 mi south of Brownsville, Texas on August 14. Moisture from Beryl moved northward along the south Texas coast and brought 0.79 in of rain to Corpus Christi on August 15. Hurricane/Tropical Storm Debby weakened as it moved across the Caribbean and was downgraded to a trough or open wave and then dissipated on August 24. Tropical Storm/Hurricane Gordon brought heavy rains and isolated tornadoes to Florida on Sunday, September 17. It became extratropical on September 18, but brought heavy rains across parts of Georgia and the eastern Carolinas into southeast Virginia. The storm had dumped over 8 in of rain in Seabring, Florida, in the central part of the state. Gordon killed 23 people in Guatemala. Hurricane Keith pounded much of Central America on October 2 with heavy rain and high winds. On October 2, Keith's center was located about 45 mi east of Belize City, Belize, and about 70 mi south-southeast of Chetumal, Mexico. With its slow motion, Keith was expected to dump as much as 20 in of rainfall on some parts of Central America. Keith killed 19 people in Belize, and caused $200 million in damages in the region. Tropical weather systems do not have to reach the level of a hurricane to wreck havoc. Even before it became Tropical Storm Leslie, this system dropped 18 in of rain in south Florida, and caused massive urban flooding and $700 million in total damage. 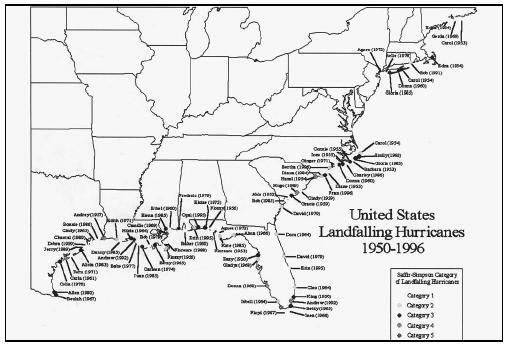 The United States recorded only modest tropical storm-damage and flooding in 2000 because none of the hurricanes made landfall. The 2001 hurricane season was an active one. There were 15 named storms of which 9 became hurricanes. Four of these became major hurricanes—Category 3 or higher on the Saffir-Simpson hurricane scale. The long-term averages are 10 tropical storms, 6 hurricanes, and 2 major hurricanes. The bulk of the activity occurred during the last 3 months of the season, during which 11 of the named storms, and all of the major hurricanes, formed. There were 3 hurricanes during November, which was the first such occurrence on record. Two major hurricanes—Iris and Michelle—struck land areas around the Caribbean, causing 48 deaths. Michelle also caused significant damage in the Bahamas. 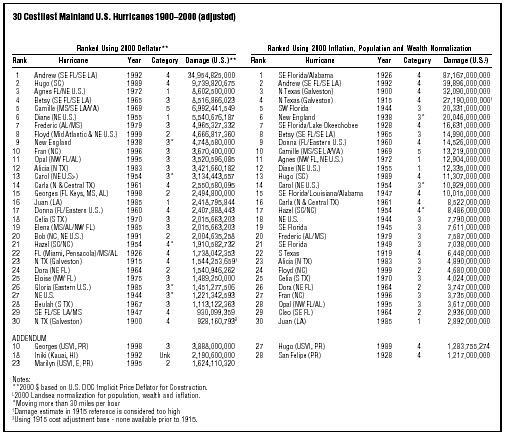 For the second consecutive year there were no U.S. hurricane landfalls, though 2 of the 3 tropical storms that hit the U.S. were almost hurricanes, and the third, Allison, caused enormous flooding, resulting in 41 deaths and billions of dollars in damage. 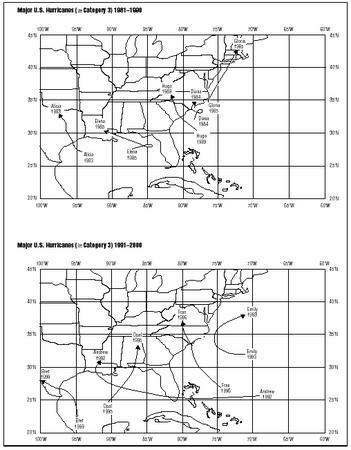 There were 2 tropical depressions that did not become tropical storms. Allison developed from a disturbance that moved from the eastern Pacific into the southwest Gulf of Mexico. On June 4, thunderstorms increased over the western Gulf, and on the morning of the 5th the system quickly developed into a tropical storm. Allison strengthened to a peak intensity of 60 mph on the afternoon of the 5th before moving inland over southeast Texas with 50 mph winds a few hours later. After moving inland, Allison rapidly weakened before stalling over eastern Texas on June 7. The remnant circulation drifted southward and emerged over the northwestern Gulf of Mexico on the 9th, where the system reorganized as a subtropical cyclone before moving inland again over Louisiana early on the 11th. The subtropical low tracked east-northeastward before stalling over eastern North Carolina on the 14th. The low was nearly stationary for almost three days before finally moving northeastward off the Mid-Atlantic coast on the 17th. The subtropical cyclone merged with a cold front on the 17th and dissipated on the 19th southeast of Nova Scotia. Allison produced extremely heavy rainfall from eastern Texas across the Gulf states and along the Mid-Atlantic coast, resulting in the most extensive flooding ever associated with a tropical storm. Damage estimates are $5.0 billion or more, and there were 41 direct deaths. Much of the damage and fatalities occurred in the Houston Metropolitan area, where more than 30 inches of rain were reported at several locations. The preliminary death toll by states is as follows: Texas 23, Florida 8, Pennsylvania 7, Louisiana 1, Mississippi 1, and Virginia 1. Michelle started as a broad low-pressure area in the southwestern Caribbean Sea. It developed into a tropical depression on October 29 along the east coast of Nicaragua. The depression remained nearly stationary over northeastern Nicaragua for two days, producing extremely heavy rains with flooding over portions of Nicaragua and Honduras. Late on the 31st the depression moved into the northwestern Caribbean Sea just north of the Honduras-Nicaragua border and strengthened into Tropical Storm Michelle. Michelle moved slowly north-northwestward for the next two days as it strengthened into a hurricane. The hurricane turned slowly northward on the 3rd, then turned northeastward on the 4th as it reached a peak intensity of 140 mph. Later that day Michelle crossed the coastal islands of Cuba as a Category-4 hurricane, then it crossed the coast of the main island of Cuba as a Category-3 hurricane. A weakening Michelle continued northeastward through the Bahamas on the 5th, and the storm became extratropical over the southwestern Atlantic on the 6th. Michelle left a trail of damage and death from central America to the Bahamas. So far 17 deaths are associated with the hurricane, including 6 in Honduras, 5 in Cuba, 4 in Nicaragua, and 2 in Jamaica. Michelle was the strongest hurricane to hit Cuba since 1952 and caused widespread damage over central and western Cuba. Additional damage was reported in the Bahamas. Widespread heavy rains over Central America and the northwest Caribbean caused extensive flooding and mud slides in Nicaragua, Honduras, and Jamaica. Minor damage was reported in the Cayman Islands and South Florida. 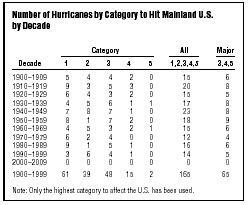 Five or more major hurricanes occurred three times in the 90's; 1995, 1996, and 1999. (A major hurricane is defined as category 3 or higher according to the Saffir-Simpson scale. A category 3 hurricane has winds of 111 to 130 mph.) 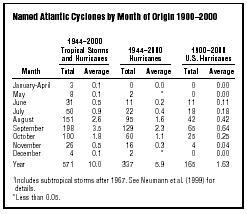 Prior to 1995, five or more major Atlantic hurricanes had not occurred in one season since 1964. A new record number of hurricanes for November was set in 2001 as Michelle, Noel, and Olga all were active in the Atlantic Basin during the month. The contiguous U.S. has not been hit directly by a hurricane now for the past two years, although tropical storms have caused significant damage, as evidenced by Tropical Storm Allison. This storm, the costliest tropical storm on record ($5 billion in damage), caused severe flooding in Texas and Louisiana before moving across the Southeast and up the East Coast. The 2002 Atlantic hurricane season was again an active one, making it the 5th consecutive active season. 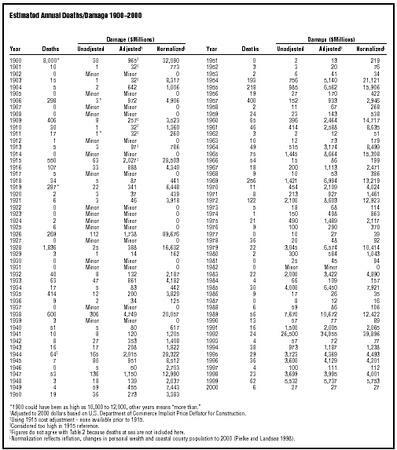 There were 12 named storms, compared to a 1944–1996 annual average of 9.8. 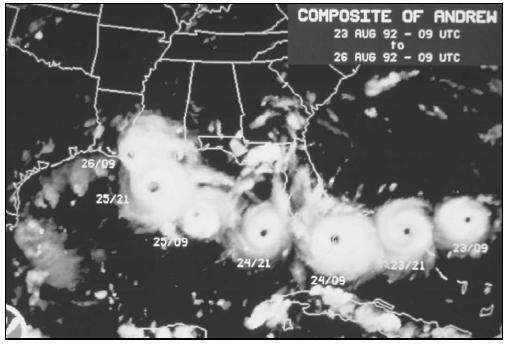 Four of those named storms became hurricanes, of which 2 were classified as major. This compares to an average of 5.8 hurricanes a year, 2.5 of which are major based on a 53-year average. There were 2 additional tropical depressions. 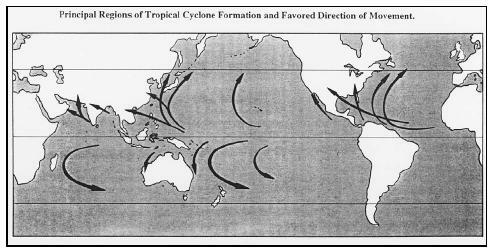 So there were more named tropical cyclones than the long-term mean, but fewer strong storms. The season was also slow to begin, extremely active in September, and less active than average at its end. Eight named systems developed in September as well as a tropical depression, making it the most active month of any month on record for tropical cyclone development in the Atlantic basin. Seven tropical storms made landfall on the continental U.S. in 2002—the most since 1998, when seven was also the number of landfalling tropical systems for the U.S. Hurricane Lili was the first hurricane to hit the coast of the U.S. since Irene in October 1999.
Notable tropical systems in 2002 include the intense Hurricanes Isidore and Lili in September and the long-lasting Hurricane Kyle, also in September. Kyle was the third-longest-lived tropical cyclone in the Atlantic basin after Ginger of 1971 and Inga of 1969. Kyle formed on September 20 and spent over 3 weeks in the North Atlantic before finally coming ashore in South Carolina on October 11. Isidore became a category-3 hurricane as it moved into the southeastern Gulf of Mexico and hit the Yucatan Peninsula on September 22 at category 3 strength. After weakening over the Yucatan Peninsula, it never quite regained hurricane strength and came ashore in Louisiana as a tropical storm. Lili was the only hurricane to make landfall in the United States in 2002, and did so at category 2. Lili had been a category 4 hurricane shortly before landfall and quickly weakened before reaching the west Louisiana coastline on October 3. 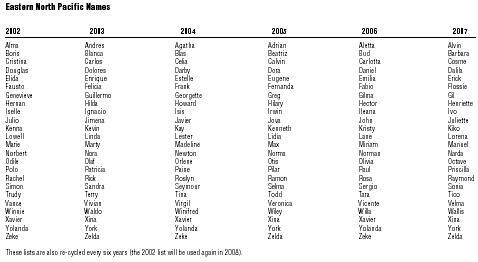 Overall in 2002, there were 12 named storms, of which four became hurricanes. Hurricanes Lili and Isidore were classified as major (category 3 or higher on the Saffir-Simpson hurricane scale). Eight storms—Tropical Storms Bertha, Edouard, Fay, and Hanna; and Hurricanes Gustav, Isidore, Kyle, and Lili—affected the coastal United States. Hurricane Lili was the only storm to make landfall while still a hurricane. The other 2002 storms were: Tropical Storms Arthur, Cristobal, Dolly, and Josephine. Hurricane forecasters at NOAA Climate Prediction Center (CPC), Hurricane Research Division, and National Hurricane Center (NHC) correctly forecast that climate conditions, including the El Niño, would reduce the overall hurricane activity this season. The forecast called for seven to 10 tropical storms, of which four to six could develop into hurricanes, with one to three classified as major. Louisiana, the hardest hit area, was battered by four storms including the powerful Hurricane Lili and Tropical Storm Isidore. The 2002 season's storms caused nine deaths in the United States and about $900 million in damages. The public relied heavily on Internet access for lifesaving information from NOAA this season. The explosive use of the Internet to convey vital information to the public in near real time has been astonishing. Between August and September the NHC web site recorded almost 500 million hits. The peak day for the season was October 3 (Hurricane Lili) when the site recorded 35.9 million hits—doubling the previous record set in 1999 during Hurricane Floyd. Guam, west of the international date line, about 3,700 miles southwest of Hawaii, was raked by wind gusts of more than 180 mph, and winds the following day of 70 mph continued in this U.S. Territory. No deaths were reported but the entire island was without electricity, and water and sewer systems were not expected to be fully operational for weeks. Sustained winds of 150 mph around the eye of Pongsona gave the storm a "super typhoon" status. Gusts up to 184 mph were reported in some areas of Guam. A wind gust of 117 mph was clocked before the National Weather Service's sensor failed, along with the radar. A reported 2,000 homes were destroyed and many more were damaged. Schools became emergency shelters. Hurricane Lili was the first hurricane to hit the United States in three years (Irene, October 1999). and was reported to be the most powerful ever recorded in the area, with winds reaching 225 mph and produced 33 foot waves that destroyed houses, uprooted trees, and flooded entire villages. Those living on the island used common sense that had come with centuries of dealing with these storms and had taken shelter in the hills on the island. It was considered a miracle that no one was killed on Tikopia, some 1,400 miles northeast of Sydney, Australia. The hurricane forecast and warning service stands as the finest of its kind in the world, distinguished by its character, credibility, and the confidence that our nation has in it. But that was not always the case. The Weather Bureau was created as a civilian agency in 1890 mainly because of a general dissatisfaction with weather forecasting under the military. The hurricane of 1875 that destroyed Indianola, Texas, without much warning was a contributing factor. It was not until the Spanish-American War of 1898 that an effort was made to establish a comprehensive hurricane warning service. President McKinley stated that he was more afraid of a hurricane than he was of the Spanish Navy. He extended the warning service to include warnings for shipping interests as well as the military. Before that, hurricane warnings were only issued for the United States coastal areas. Hurricane warning stations were established throughout the West Indies. A forecast center was established in Kingston, Jamaica, and later moved to Havana, Cuba, in 1899. The warning service was extended to Mexico and Central America. This recognition of the international responsibility for the United States hurricane warning service continues today under the auspices of the World Meteorological Organization (WMO) of the United Nations. In 1900, the infamous Galveston, Texas, hurricane killed at least 8,000 people—the greatest natural disaster in United States history. There was no formal hurricane warning and this calamity prompted the transfer of the warning service to Washington, D.C., where it remained until 1935. In the 1920s, there were several hurricanes that hit with little or no warning, leading to dissatisfaction with the hurricane service operating out of Washington. The coastal communities felt that Washington was insensitive to the hurricane problem. In 1926, a very strong hurricane (category 4 by today's standard) brought great devastation to southeast Florida, including Miami and Ft. Lauderdale, causing more than 200 deaths. The warnings for that storm were issued at night when most residents were asleep and unaware of the rapidly approaching hurricane. In 1928, another severe hurricane hit south Florida and killed an estimated 1,800 people, who drowned when Lake Okeechobee overflowed. In 1933, the largest number of tropical storms—21—developed. Nine of them were hurricanes and two that affected the east coast of the United States, including Washington, were badly forecast and the public was inadequately warned. In 1934, a forecast and warning for an approaching hurricane in the very sensitive Galveston area was again badly flubbed by Washington. These incidents led Congress and the President to revamp and decentralize the Hurricane Warning Service. Improvements included 24-hour operations with teletypewriter hookup along the Gulf and Atlantic coasts; weather observations at six hourly intervals; hurricane advisories at least four times a day; and a more adequate upper air observing network. New hurricane forecast centers were established at Jacksonville, Florida; New Orleans, Louisiana; San Juan, Puerto Rico; and Boston, Massachusetts (established in 1940). In 1943, the primary hurricane forecast office at Jacksonville was moved to Miami, Florida, where the Weather Bureau established a joint hurricane warning service with the Army Air Corps and the Navy. It was also in 1943 that Col. Joseph Duckworth made the first intentional plane reconnaissance flight into the eye of a hurricane. The following year, regular aircraft reconnaissance was begun by the military, giving hurricane forecasters the location and intensity of the storms for the first time. 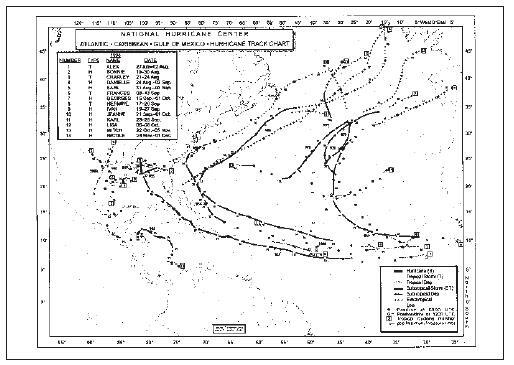 The Miami office was officially designated as the National Hurricane Center (NHC) in 1955. In the 1950s, a number of hurricanes, including Hazel, struck the East Coast, causing much damage and flooding. Congress responded with increased appropriations to strengthen the warning service and intensify research into hurricanes. The Weather Bureau organized the National Hurricane Research Project. The Air Force and Navy provided the first aircraft to be used by the Project to investigate the structure, characteristics, and movement of tropical storms. In 1960, radar capable of "seeing" out to a distance of 200–250 mi from their coastal sites were established at strategic locations along the Atlantic and Gulf coasts from Maine to Brownsville, Texas. On April 1, 1960, the first weather satellite was placed in orbit, giving hurricane forecasters the ability to detect storms before they hit land. The day is past when a hurricane could develop to maturity far out to sea and be unreported until it thrust toward land. The 1970–90s have seen greater emphasis on the need for hurricane preparedness among the hurricane-prone communities in the United States, as well as in the Caribbean. The rapid development of America's coastal areas has placed millions of people with little or no hurricane experience in the path of these lethal storms. For this vulnerable coastal population, the answer must be community preparedness and public education in the hope that education and planning before the fact will save lives and lessen the impact of the hurricane and its effects. There has been increased national awareness of the hurricane threat through the cooperation of local and state emergency officials and the enlistment of the news media and other federal agencies in the campaign to substitute education and awareness for the lack of first-hand experience among the ever-increasing coastal populations. New technology and advances in the science under the weather service's modernization program now underway will lead to more improvement and effectiveness in the forecasting and warning of hurricanes. Meteorologists with NOAA's National Weather Service (NWS) monitor the massive flow of data that might contain the early indications of a developing storm somewhere over the warm sea. Cloud images from Earth-orbiting satellites operated by NOAA keep Earth's atmosphere under virtually continuous surveillance, night and day. Meteorological data from hundreds of surface stations, radar and balloon probes of the atmosphere, and information from hurricane-hunting aircraft are other tools of the hurricane forecaster. Long before a storm has evolved even to the point of ruffling the easterly wave, scientists at NOAA's National Hurricane Center (NHC) in Miami, Florida, have begun to watch the disturbance. In the satellite data coming in from both polar-orbiting and geostationary spacecraft, and in reports from ships and aircraft, the scientists look for subtle clues that mark the development of hurricanes—cumulus clouds covered by the cirrostratus deck of a highly organized convective system; showers that become steady rains; dropping atmospheric pressure; intensification of the trade winds, or a westerly wind component there. Then, if this hint of a disturbance blooms into a tropical storm, it receives a name. Naming the storm is a signal that brings the warning systems to readiness. As an Atlantic hurricane drifts closer to land, it comes under surveillance by weather reconnaissance aircraft of the U.S. Air Force Reserve, the famous "Hurricane Hunters," who bump through the turbulent interiors of the storms to obtain precise fixes on the position of the eye, and measure winds and pressure fields. Despite the advent of satellites, the aircraft probes are the most detailed information hurricane forecasters receive. The hurricanes are also probed by the "flying laboratories" from NOAA's Aircraft Operations Center in Miami. Finally, the approaching storm comes within range of a radar network stretching from Texas to Maine, and from Miami to the Lesser Antilles. Through the lifetime of the hurricane, advisories from the NHC warning give the storm's position and what the fore-casters in Miami expect the storm to do. As the hurricane drifts to within a day or two of its predicted landfall, these advisories begin to carry watch and warning messages, telling people when and where the hurricane is expected to strike, and what its effects are likely to be. Not until the storm has decayed over land and its cloud elements and great cargo of moisture have blended with other brands of weather does the hurricane emergency end. This system works well; the death toll in the United States from hurricanes has dropped steadily as NOAA's hurricane tracking and warning apparatus has matured. Although the accuracy of hurricane forecasts has improved over the years, any significant improvements must come from quantum leaps in scientific understanding. TROPICAL WAVE: A trough of low pressure in the trade-wind easterlies. TROPICAL DEPRESSION: Rotary circulation at surface, highest constant wind speed 38 mph or less. TROPICAL STORM: Distinct rotary circulation, constant wind speed ranges 39–73 mph. HURRICANE: Pronounced rotary circulation, constant wind speed of 74 mph or greater. TROPICAL STORM WATCH: Is issued for a coastal area when there is the threat of tropical storm conditions within 24–36 hours. TROPICAL STORM WARNINGS: May be issued when winds of 39–73 mph are expected. If a hurricane is expected to strike a coastal area, tropical storm warnings will not usually precede hurricane warnings. HURRICANE WATCH: Is issued for a coastal area when there is a threat of hurricane conditions within 24–36 hours. HURRICANE WARNING: Is issued when hurricane conditions are expected in a specified coastal area in 24 hours or less. FLASH-FLOOD WATCH: Means a flash flood is possible in the area; stay alert. FLASH-FLOOD WARNING: Means a flash flood is imminent; take immediate action. In NOAA's Environmental Research Laboratories, scientists follow eagerly as nature furnishes additional specimens of the great storms—specimens they can probe and analyze to gather ever-greater understanding of the mechanics of the storms. Such analyses assist the forecasters with their warnings. The GOES-10 (Geostationary Operational Environmental Satellite) series of satellites has provided more accurate and higher-resolution sounding data than provided from geosynchronous satellites, and similar improvements can be expected from the polar orbit satellite systems. Major improvements in longer-range hurricane forecasts (36–72 hours) will come through improved dynamical models. Global, hemispheric, and regional models show considerable promise. Present operational reconnaissance aircraft provide invaluable data in the core of the hurricane. Doppler radar is now an integral part of NOAA's research aircraft operations, providing entire data fields within several miles of the aircraft's path. Next Generation Radar (NEXRAD), also known as WSR-88D, has added new dimensions to hurricane warning capabilities. The NEXRAD stations use Doppler radar technology to provide much-needed information on tropical cyclone wind fields and the wind fields' changes as they move inland. Local offices are able to provide accurate short-term warnings as rain bands, high winds, and possible tornadoes move toward specific inland locations. Heavy rains and flooding frequently occur over widespread inland areas. Improved observing systems and anticipated improvements in analysis, forecasting, and warning programs require efficient accessing, processing, and analysis of large quantities of data from numerous sources. These data also provide the opportunity for improved numerical forecasts. The Class VII computer at the National Meteorological Center permits operational implementation of next-generation hurricane prediction models. The NWS's Advanced Weather Interactive Processing System (AWIPS) will be another tool for forecasting hurricanes. AWIPS is a highly automated and integrated weather information processing, communications, and display system that will be deployed to Weather Forecast Offices (WFO), River Forecast Centers (RFC), and the National Centers for Environmental Prediction (NCEP). Critical high-resolution hurricane information needed by local, state, and other federal agencies as well as the private sector, will be displayed graphically and transmitted to the user faster and more completely than ever before, making more effective warning and evacuation response. Aerial weather reconnaissance is vitally important to the forecasters of the National Hurricane Center. Aircraft reports help the meteorologist determine what is going on inside a storm as it actually happens. This, along with the broader view provided by data from satellites, floating buoys, and land and ship reports, makes up the total "package" of information available to hurricane forecasters who must make forecasts of the speed, intensity, and direction of the storm. Reconnaissance aircraft penetrate to the core of the storm and provide detailed measurements of its strengths as well as accurate location of its center—information that is not available from any other source. The NHC is supported by specially modified aircraft of the U.S. Air Force Reserve (USAFR) and NOAA's Aircraft Operations Center (NOAA/AOC) The USAFR crews fly the Lockheed WC-130 Hercules, a giant four-engine turboprop aircraft that carries a crew of six people and can stay aloft for up to 14 hours. NOAA's AOC flies Lockheed WP-3 Orion, a four-engine turboprop aircraft that carries a crew of 7–17 persons and can stay aloft for up to 12 hours at a time. The NOAA/AOC aircraft and crews are based at Miami International Airport. Both units can be deployed as necessary in the Atlantic, Caribbean, Gulf of Mexico, and Central Pacific Ocean. Meteorological information obtained from aerial reconnaissance includes measurements of the winds, atmospheric pressure, temperature, and the location of the center of the storm. In addition, these aircraft also drop instruments called dropsondes as they fly through the storm's center. These devices continuously radio back measurement of pressure, humidity, temperature, wind direction, and speed as they fall toward the sea. This information provides a detailed look at the structure of the storm and an indication of its intensity. Aerial weather reconnaissance of nature's most powerful destructive force is not without risk. Since aircraft and crews first started flying into hurricanes and typhoons nearly 40 years ago, three have been lost, vanishing without a trace along with their crews. The first of these, a U.S. Navy P2V Neptune fell into the Caribbean Sea while flying into Hurricane Janet on September 26, 1955. Next came a U.S. Air Force WB-50 Super Fortress, which crashed into the Pacific Ocean on January 15, 1958 while penetrating Typhoon Ophelia. Also lost was a WC-130 Hercules that disappeared in the vicinity of Typhoon Bess in the Philippine Sea south of Taiwan on October 12, 1974. Flying into a hurricane is like no other experience. Crew members who have flown combat missions say that their feelings before these flights and those involving hurricanes are very similar. There is a blend of excitement and apprehension that is difficult to describe. Adding to the tension is the fact that no two hurricanes are alike. Some are gentle while others seem like raging bulls. Preparations for flying into a hurricane are very thorough. All crew members are fully trained by highly trained specialists. The crew takes special precautions as they enter the hurricane. All loose objects are tied down or put away and crew members slip into safety harnesses and belts. When radar picks up the storm, the crew then determines how to get inside. The idea is to make the aircraft mesh with the storm rather than fight it. If it is a well-defined storm, getting inside can be a real experience. The winds at flight altitude often exceed 100 mph, and the wall cloud surrounding the center, or eye, can be several miles thick. Rain comes down in torrents, and the updrafts and downdrafts are usually strong and frequent. Inside the eye, however, the conditions are much different. The ocean is generally visible, and there is blue sky and sunshine. The flight level winds are nearly calm. After gathering all the information they need, the crew then exits the storm in the same manner they entered. *Moving more than 30 miles per hour. @Only of Tropical Storm intensity. coordinating requirements and arranging for the supporting flights. This office also records and monitors weather observations radioed back or received through direct satellite communication from the storm by the on-board meteorologists. These data are checked for accuracy and then transmitted to the worldwide meteorological community, through both military and civilian communications circuits. 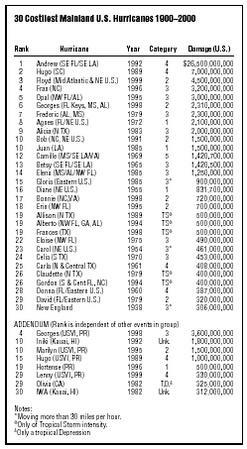 April 12, 2001…Gulfport, MS. As attractions go, "Big Boy" ranks decidedly lower than the Grand Canyon and Niagara Falls. But the cat—so-named for his impressive girth—has nonetheless attracted a cult following. Big Boy blew into town three years ago, riding the tail of Hurricane Georges. He was hurled off a bait shop roof and dropped onto a 60-foot oak tree in Jones Park. From his perch, the 4-year old tabby has since nurtured his celebrity status. Children and fishermen bring him treats. Big Boy has apparently never left his tree house since the 1998 storm, and he weighs at least 20 pounds and eats and drinks from dishes nailed to the tree—and he is not shy about demanding refills. When not sleeping or sharpening his claws, Big Boy moves from limb to limb for exercise. November 9, 1998… Trujillo, Honduras. Swept out of her village by Hurricane Mitch, a 36-year old woman drifted alone for six days far into the Caribbean Sea. Her husband and three children had been killed in the storm. All she had was a makeshift raft, the sea below, the sun during the day, and the moon at night. No land was in sight. On the sixth day she spotted a duck nearby. Her desperation ended hours later. She was spotted by an airplane looking for a yacht that had disappeared during the storm. A British helicopter rescued her. She and her family had lived in the village of Barra de Aguan, near the mouth of the Aguan River. Normally her house was about 2 miles from the sea and more than a mile from the river on the other side. But when Mitch stalled over the Honduran coast on October 28, the sea and the river merged. Her house was quickly swept away and her family took refuge at a neighbor's home. Fourteen people climbed onto the roof, but soon the river tore through the house. One of her sons was ripped away from her, and she clung to some floating palm branches for four hours. Using debris in the water, she made a 4-by-4-foot raft out of tree roots, branches, and motorboard. While at sea she found coconuts, which gave her milk. She was found by the plane on November 2. She was picked up about 25 miles north of Guanaja Island, and about 75 miles from her home. Aircraft meteorological reconnaissance is a team effort. A host of different organizations, tied together by CARCAH, is dedicated to providing the NHC the vital information it needs to make accurate forecasts that help to ensure that communities in the path of a hurricane are adequately warned. Science may never provide a full solution to the problems of hurricane safety. But warnings and forecasts help save countless lives and allow residents to take the necessary precautions to prevent enormous property damage each year. **2000 $ based on U.S. DOC Implicit Price Deflator for Construction. L 2000 Landsea normalization for population, wealth and inflation. 2 Using 1915 cost adjustment base-none available prior to 1915. & Highest category justified by winds. # Classified 4 because of estimated winds. + Cape Fear, NC area only; was a category 2 at final landfall. equal sum of sectional totals. 1 Includes subtropical storms after 1967; excludes depressions. 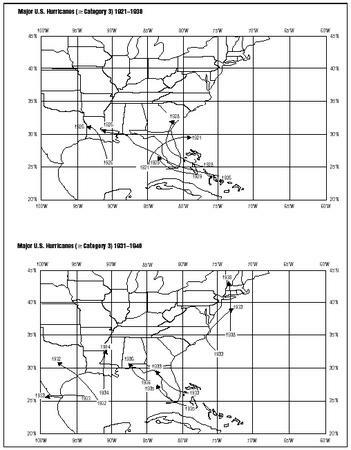 2 Distinction of hurricanes recorded only after 1885. Note: Only the highest category to affect the U.S. has been used. 1 Includes subtropical storms after 1967. See Neumann et al. (1999) for details. Incidence of Direct Hits on U.S.
necessarily equal the sum of sectional entries. *1900 could have been as high as 10,000 to 12,000, other years means "more than." 1 Adjusted to 2000 dollars based on U.S. Department of Commerce Implicit Price Deflator for Construction. 2 Using 1915 cost adjustment-noneavailable prior to 1915. 3 Considered too high in 1915 reference. S Figures do not agree with Table 2 because deaths at sea are not included here. L Normalization reflects inflation, changes in personal wealth and coastal county population to 2000 (Pielke and Landsea 1998). *Could have been as high as 10,000 to 12,000. 2 Using 1915 cost adjustment - noneavailable prior to 1915. L Landsea normalization reflects inflation, changes in personal wealth and coastal county population to 2000 (Pielke and Landsea 1998). We just recently moved from Jacksonville, Fl to Jasper, Ga(Pickens County) Could you tell us when the last hurricane to hit Pickens County was & what was the category. Also, how often has a hurricane made landfall in Ga. This is so cool. I think I might be able to use this for my research, :3 Yay! I need to know how they measure hurricanes.And plus I need to know what is a scale,what are precautions and so on. How or why are some hurricanes stronger than others? How do they gain more power whilst traveling over the ocean or land? I need to know the effects of Hurricanes in Spain. Positive or Negative! Why conditions effect to travellers in Spain! If any figures from last year could given as an example would be helpful..
Could you direct me to the list of casualties from the 1923 hurricane. My great aunt Florence Coffin Borden was in Florida at the time and none of the family ever heard from her again. I think that it can be shorted up a bit. What controls the speed of a hurricane? We just watched Hurricane Joaquin slow down to 3mph and became almost stationary over the southern Bahamian islands, then he made a northern turn and is moving much faster 10mph and probably faster by now. Can you please add hurricanes hitting Mexico? I looked to this sight for help on my science project on Hurricane Madeline in 1976, and I can't find any information on it.